Since I’m trying to do a new veggie each week, I’d be remiss not to talk about the Dirty Dozen and Clean Fifteen. Although this has been a thing for a while, I’m still trying to get on board. The “dirty dozen” and the “clean fifteen” are ways to deal with the about pesticides that are so difficult to wash off of the fruits and vegetables. These guidelines (which basically is just a list of foods) are a great place to know when to buy organic and when it is safe to buy regular. Today’s post was prompted by a recent food report that found some multiple samples of kale with 18 types of pesticide residue. Yikes! And kale is listed as number 3, meaning strawberries and spinach are worse offenders. The dirty dozen are the fruits and vegetables that have too much pesticide residue, washing doesn’t remove it and buying organic is a better solution. The clean 15 are okay to buy non-organic. I live in an area that has many choices of fruits and vegetables year round. And it’s not always apparent which ones to buy. Just like most things, price is one of the biggest factors. But now, as I continue to commit myself to getting fit and strong, keeping poisons out of my system has become more important. It’s hard to realize the huge role pesticides play because it’s very cumulative. Okay, so if you have trouble remember which fruits and vegetables are on which list, you may download this list of the Dirty Dozen and Clean 15 I typed up for myself. It is not a PDF, it is in Word. That way you can change it around as suits your shopping list! On my personal shopping list, I like to highlight what I’m going to buy. 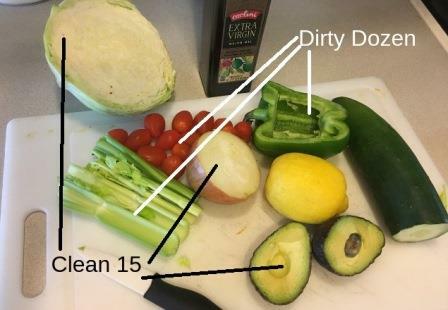 Either way, you can also cut out the list of the Dirty Dozen/Clean 15 and carry the little chart when you’re shopping. The photo I used was from a salad I had a few weeks ago. (Full disclosure, the only thing I bought organic was the avocado because they were ripe. But I’m trying to do better.) Notice the cucumber and the lemon didn’t make the list. Although I’m guessing it would be better to peel the cucumber and not zest the lemon. Just guessing here. Do you follow the Dirty Dozen/Clean 15 recommendations? Do you have a good way to remember them? Maybe a little song or something?